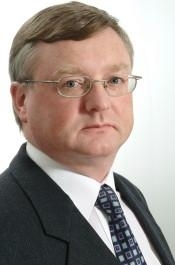 Paul McVeigh is a managing editor for Automotive News Europe. Chevrolet has big plans to boost sales in EU markets where it only has a 1.2 percent market share -- but it won't lose its American-ness, says its Europe boss, Wayne Brannon. In Europe, Chevy is known as a low-cost brand that sells value-for-money models such as the Aveo. The General Motors unit's strategy is to boost its image by selling U.S.-built halo cars such as the Corvette alongside affordable cars like the Spark made by GM Daewoo in Korea. Some observers say buyers will be confused, but Brannon has no such concerns. 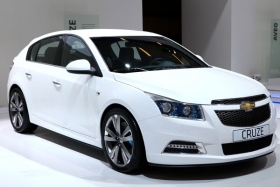 Chevrolet unveiled the Cruze hatchback at the Paris auto show. In Paris, Chevrolet unveiled new models designed for the first time with European buyers in mind including the five-door Cruze hatchback, which it hopes will be a challenger in Europe's second-biggest market segment, and the Orlando minivan, which won't be sold in the U.S.
Brannon said Chevrolet plans to boost its European presence by 2016 to cover two thirds of the market segments -- up from a quarter now. His target is to double sales to 500,000 units, or 1 million including Russia, where Chevy is the top-selling foreign brand.